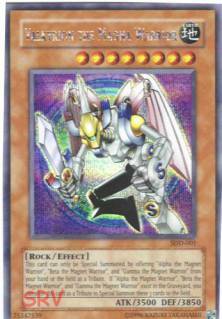 Description: This card san only be Summoned by offering “Alpha the Magnet Warrior”, “Beta the Magnet Warrior”, and “Gamma the Magnet Warrior” from your hand or the field as a Tribute. If “Alpha the Magnet Warrior”, “Beta the Magnet Warrior”, and “Gamma the Magnet Warrior” exist in the Graveyard, you can offer this card as a Tribute to Special Summon these 3 cards to the field. My Rating: 3/5 A great card, but it’s hard to get all 4 cards (including Valkyrion) needed to summon it.